One year after launching the successful live game show app HQ Trivia, Intermedia Labs is planning a new game called HQ Words. Instead of a basic series of trivia questions and multiple choice answers, HQ Words has a hidden phrase presented in a series of letter blocks that look like the puzzles from "Wheel of Fortune" (via Digiday). Players will be presented with a clue for each puzzle, and below the empty tiles are letters that they can select to complete it. You'll get three strikes, and will be awarded for each correct letter you choose. 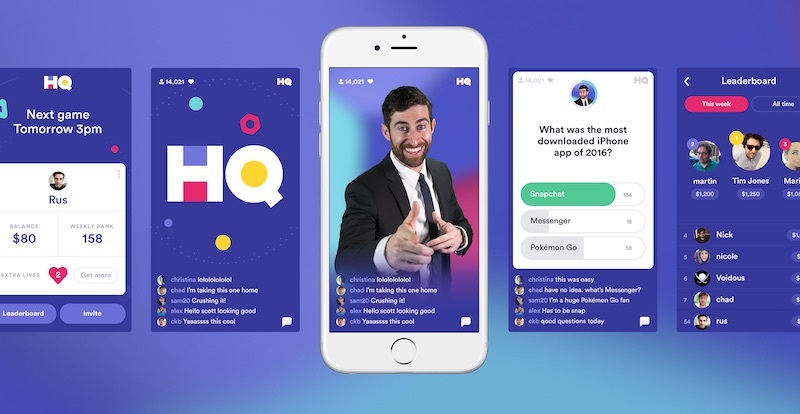 HQ Words will be live, just like HQ Trivia, so every player will be solving the same puzzle at the same time, and those with the most points win the jackpot. “We’re trying to diversify a bit, and that’s where my skill-set comes in handy. My favorite part of working here is your imagination runs wild when you look at what we’re doing and you apply that to any idea. The sky is the limit, but the challenge is how do we build them,” Kroll said. The company is hoping that it can avoid some of the problems that have been prevalent in HQ Trivia over the past year, namely including numerous glitches, technical challenges, and cheating. Sponsorships in HQ Words have not yet been mentioned, but given the frequency of sponsors in HQ Trivia, users can likely expect the same for the new game. A specific launch date for HQ Words was not confirmed, but you should see it appear on the iOS App Store in October. Will it be in the HQ app or will I need a separate app for it? It started this week. The next one is at 9:30 Eastern tonight.